Bring a large pot of salted water to a boil. Add the asparagus and cook until crisp-tender, 3 minutes. Using a slotted spoon, transfer the asparagus to a plate and pat dry. KEEP THE WATER (do not drain). Let cool 5 minutes. Once the asparagus has cooled, transfer it to a food processor. Add the garlic, almonds, cheese, salt and pepper. Pulse until combined. With the motor running, add the olive oil until you get a pesto consistency. Taste and salt if needed. In the meantime, bring the water back to a boil and cook the shells until al dente, about 6 minutes. Drain and toss with asparagus pesto. Serve hot or at room temperature. You guys, it's happening. Now that spring has sprangidy sprung, the pesto plague doth stricken. It's all I think about. It's all I dream about. These days my hands are on autopilot to grab the processor, something green, some nuts, garlic, cheese, oil and blitzeroo my life into grand glory. No, I'm not applying a pesto body scrub right now, why do you ask? It's not that I'm bored with the traditional way of preparing pesto, with basil and pine nuts. Oh good grief no. I just felt like upping my own pesto ante and slipping in one of spring's shining stars for an unexpected "Whoa Nellie!" twist on the beloved paste that wins the hearts of many. Did you feel that? That was the collective rumble of our hearts pitter pattering. We have: little pasta shells, some almonds, asparagus, good parmesan cheese, garlic, oil, salt and pepper. Oh! Toast your almonds in a little skillet or a toaster oven for a few minutes, just to bring out that good flavor a little more. Trim the ends of your 'sparagus and slice them into 2-inch pieces. Throw them into some boiling water and cook about 3 minutes. Then using a slotted spoon, transfer them to a plate and pat them dry, like deez. Keep the water because we're just going to use that for the pasta. Look at us all environmental! Now, once the spears have cooled a little, dump them into a food processor along with the almonds, garlic, cheese, salt and pepper. Start blitzing it all together. With the motor running, add the oil in a thin stream. Beautiful and wondrous. And the pesto's not so bad either. OHHHH. But really, taste that on a cracker and feel the magic in your heart. 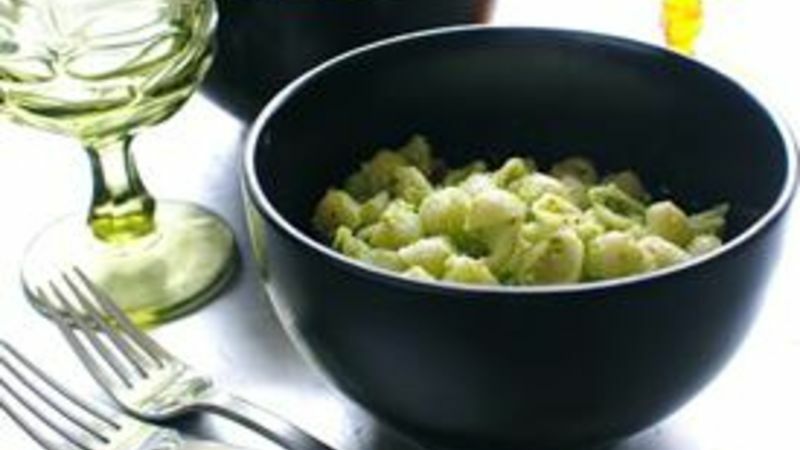 Now, cook up your pasta until it's al dente, drain and toss with the pesto. No, really. LOOK. AT. THAT. *Bev will get on hands and knees and beg you to make this. She's prepared for it. For more musings, visit her blog Bev Cooks and her Tablespoon profile.